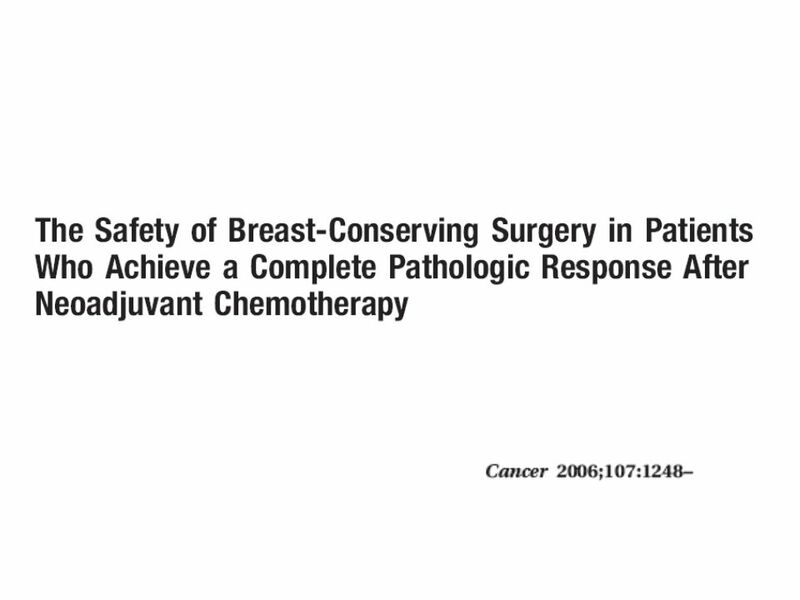 Improve Surgical Options Obtain Information on Response Obtain Long Term Disease Free Control JCO Vol 24, pp 1940-, 2006. 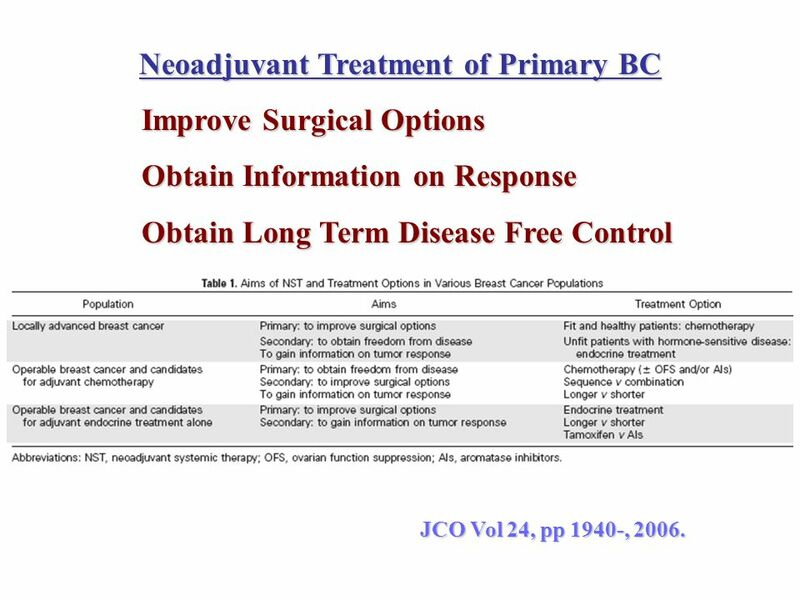 3 Neoadjuvant Treatment of Primary BC Caution on Future Trial Design! 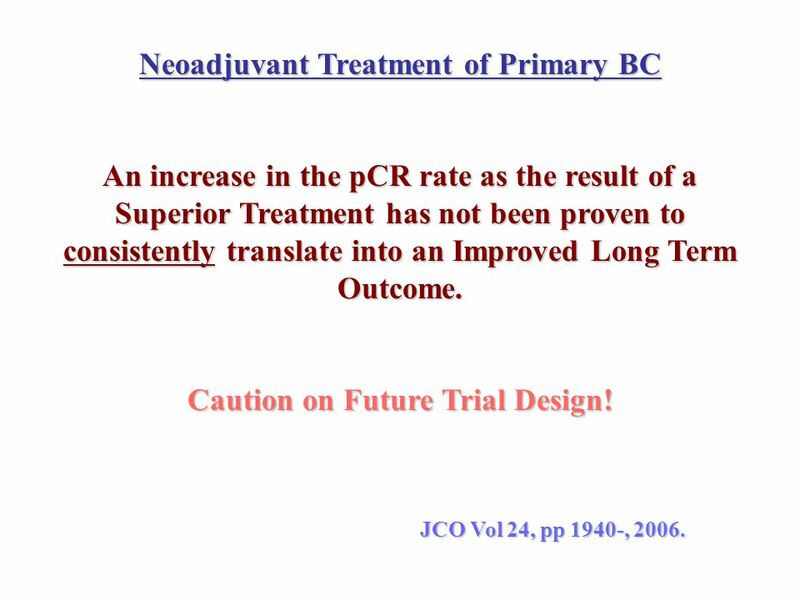 An increase in the pCR rate as the result of a Superior Treatment has not been proven to consistently translate into an Improved Long Term Outcome. 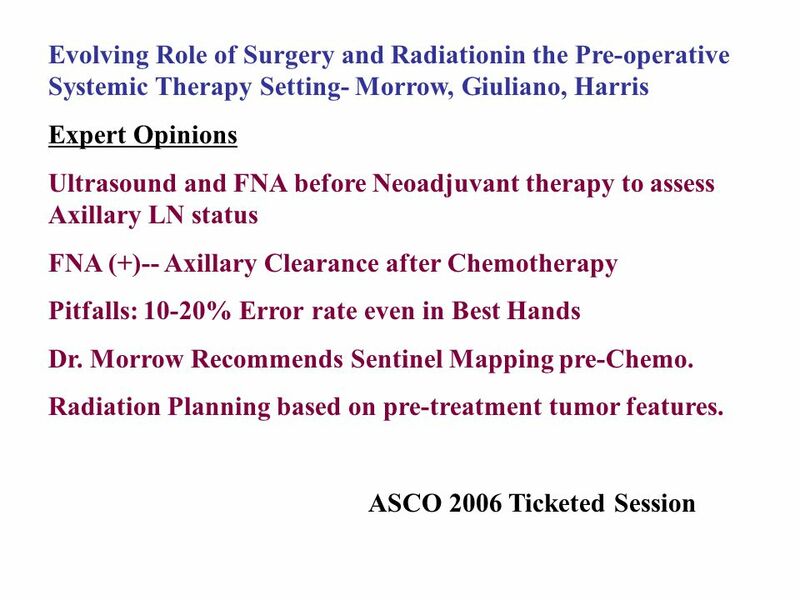 Caution on Future Trial Design! JCO Vol 24, pp 1940-, 2006. 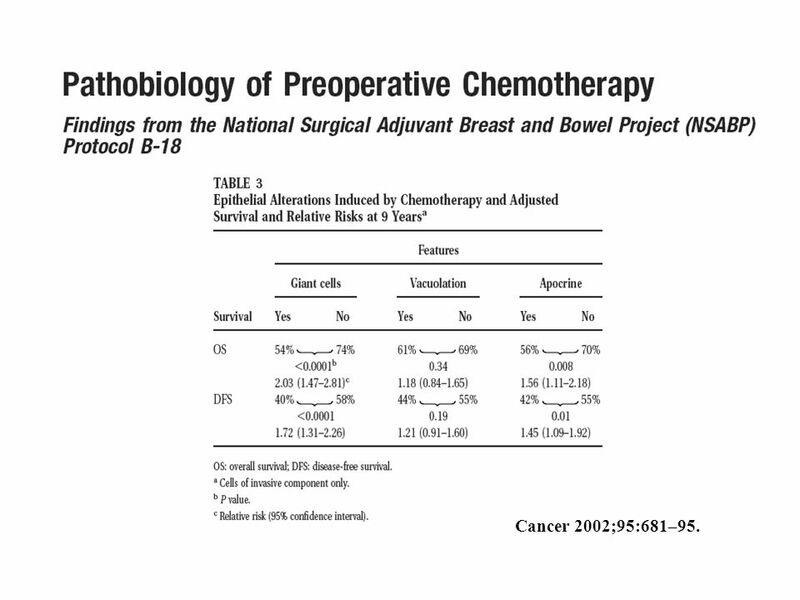 Annals of Surgery Vol. 243, pp 257- , 2006. 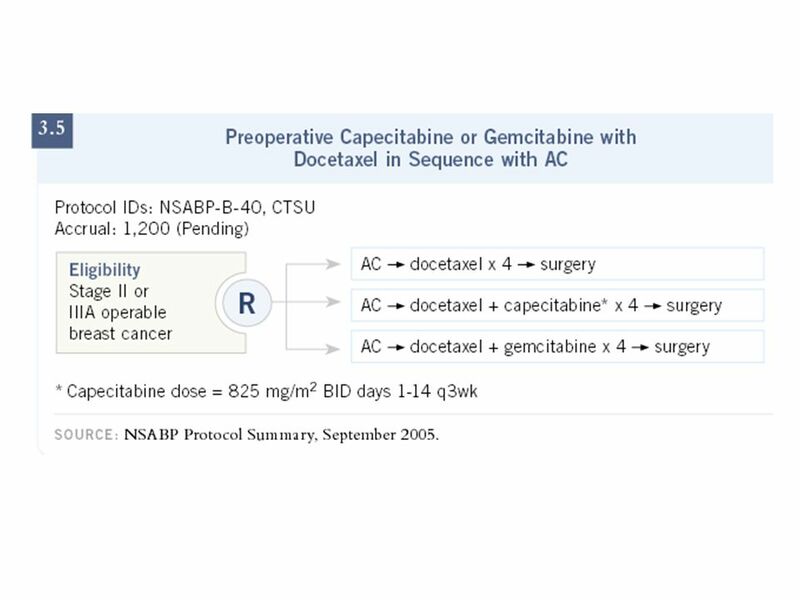 13 doxorubicin 50 mg/m2 plus docetaxel 75 mg/m2 each on day 1 every 14 days for 4 cycles with granulocyte colony-stimulating factor support (ADOC) versus doxorubicin 60 mg/m2 plus cyclophosphamide 600 mg/m2 on day 1 every 21 days followed by docetaxel 100 mg/m2 every 21 days for 4 cycles (AC-DOC). 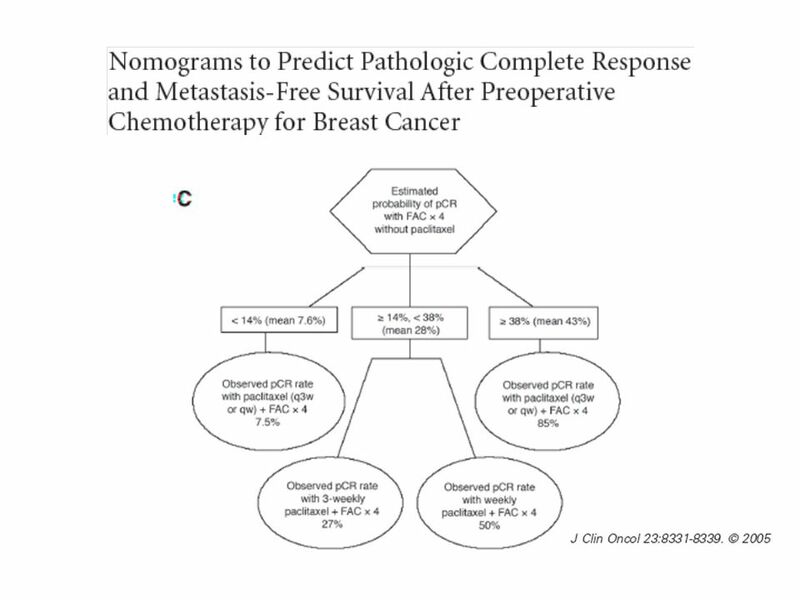 Factors associated with a significantly higher breast-conserving surgery rate: pre-chemotherapy tumor size < 40 mm, non-lobular histological characteristics, treatment with AC-DOC, clinical response, post-chemotherapy tumor size < 20 mm, and treatment in a larger center (>10 enrolled patients). 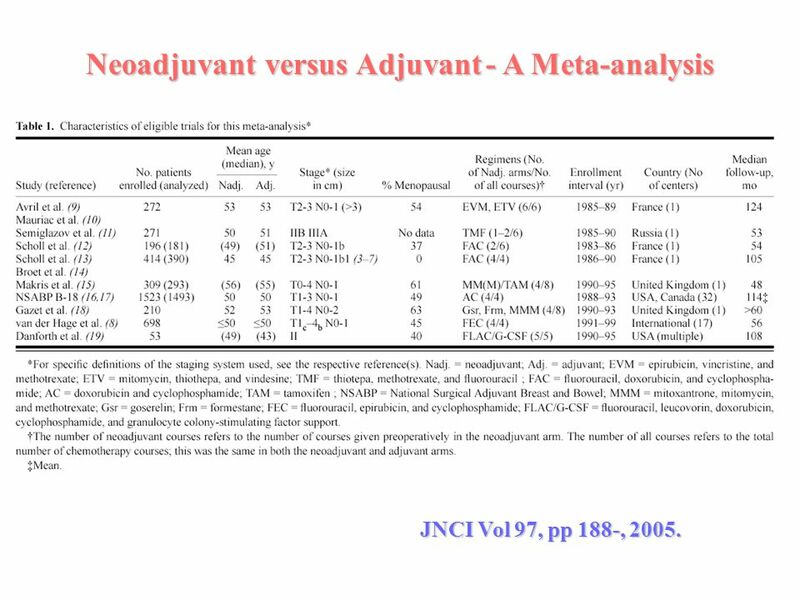 24 Neo!Adjuvant Cancer 2006; 107:1459–66. 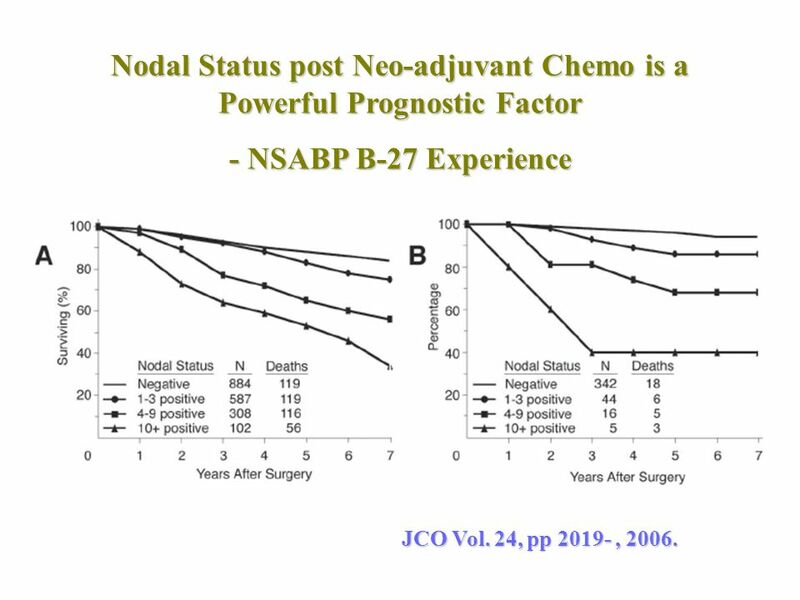 A total of 143 neoadjuvant and 170 surgery-first patients were studied. 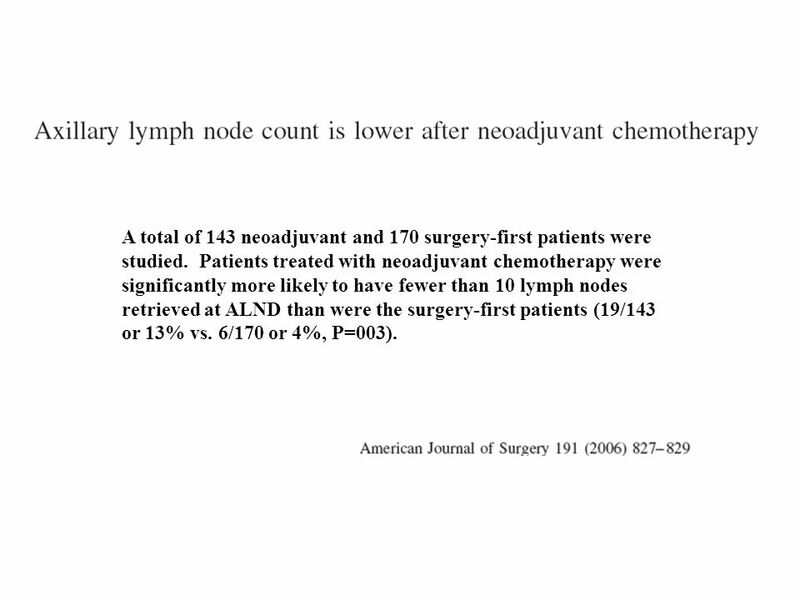 Patients treated with neoadjuvant chemotherapy were significantly more likely to have fewer than 10 lymph nodes retrieved at ALND than were the surgery-first patients (19/143 or 13% vs. 6/170 or 4%, P=003). 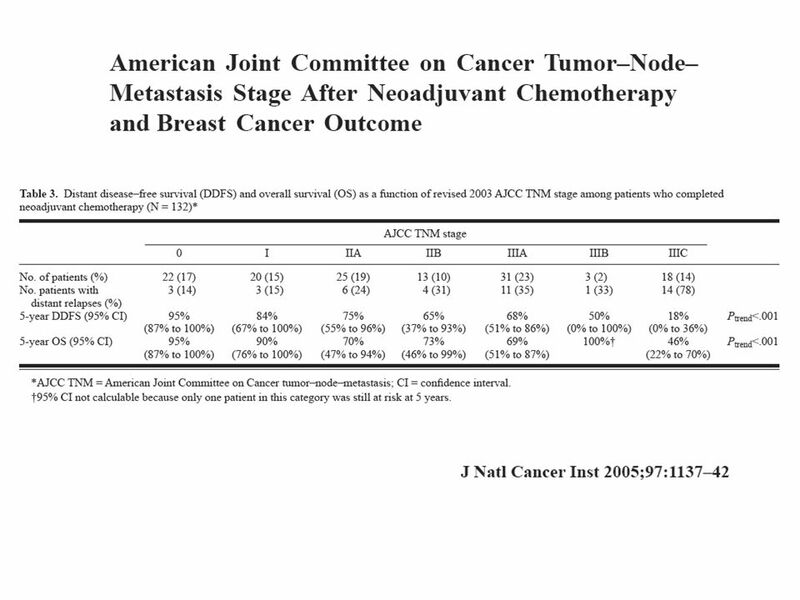 JNCI Vol 97, pp 188-, 2005. 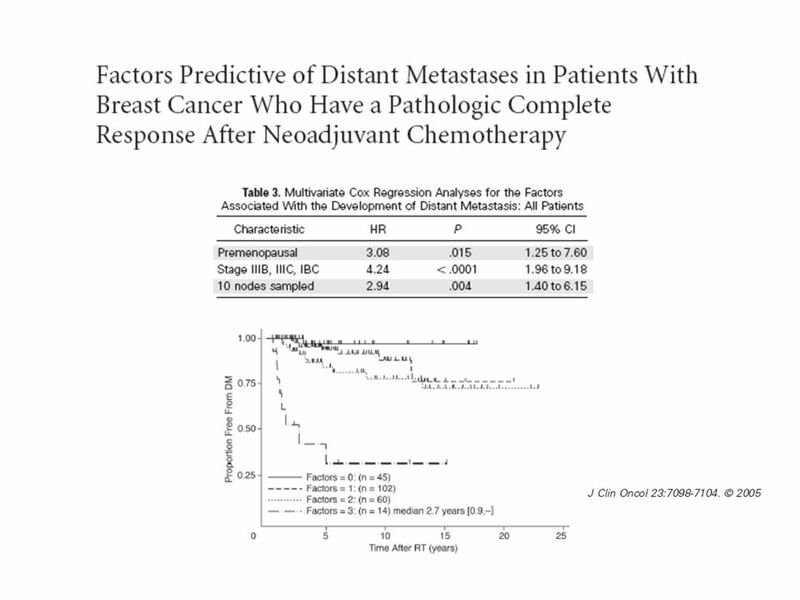 Equivalent in Survival and Overall Disease Progression. 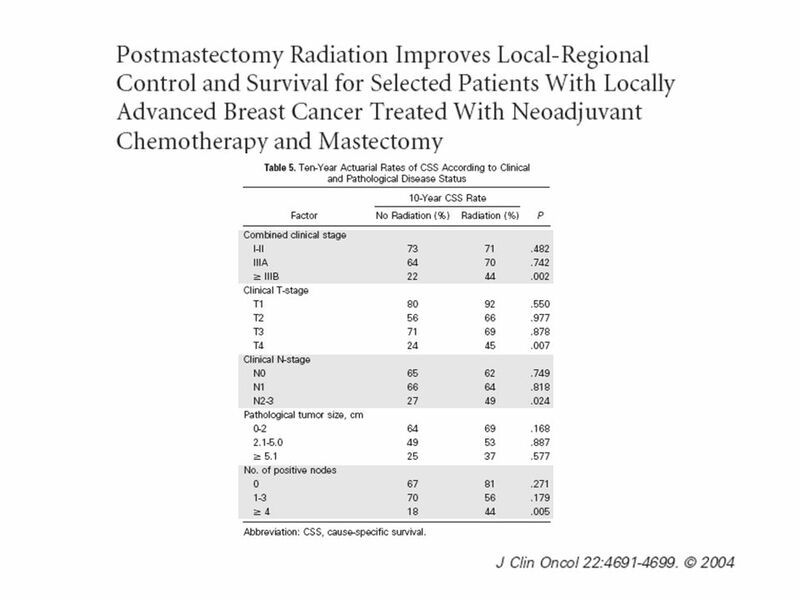 Statistically Significant Increased Risk of Loco-Regional Relapse if RT without Surgery. 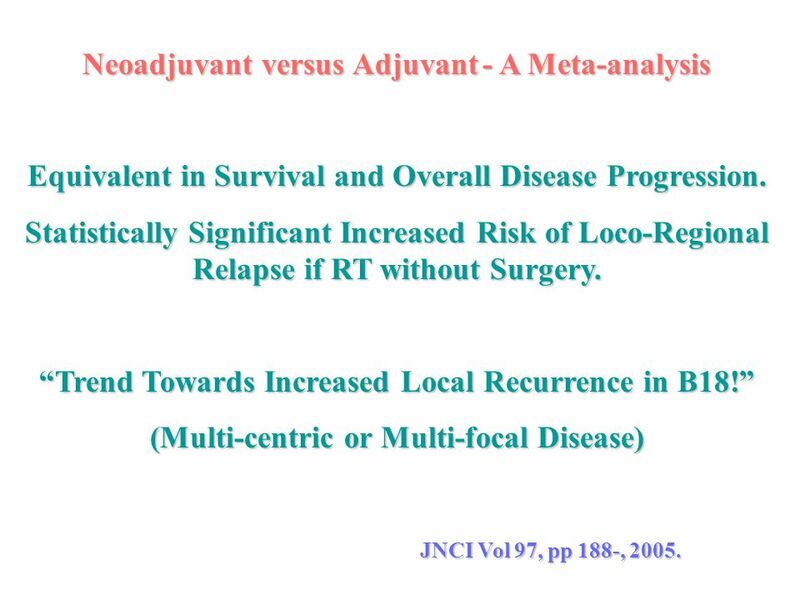 “Trend Towards Increased Local Recurrence in B18!” (Multi-centric or Multi-focal Disease) JNCI Vol 97, pp 188-, 2005. ID rate: 85%; False (-): 10.7%; Only Node (+): 56%. JCO Vol. 23, pp , 2005. 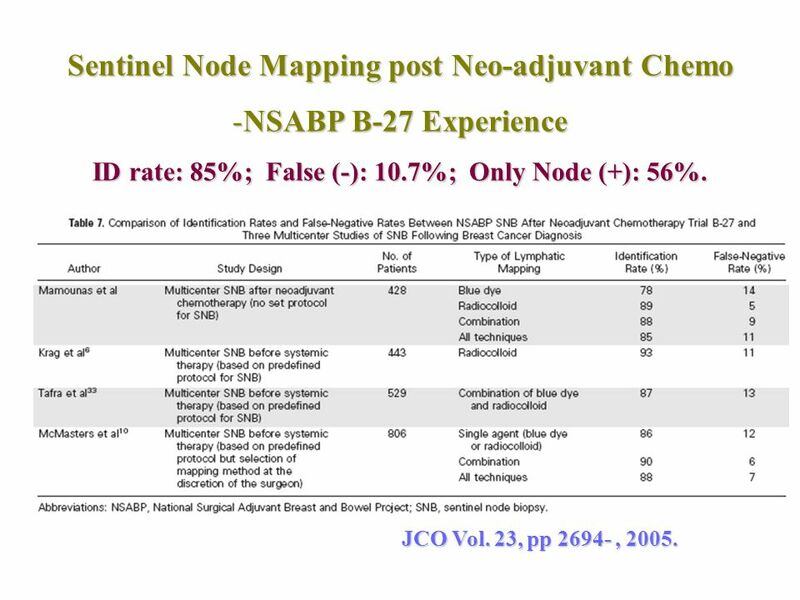 38 Neoadjuvant Treatment of Primary BC Caution on Future Trial Design! - NSABP B-27 Experience JCO Vol. 24, pp , 2006. 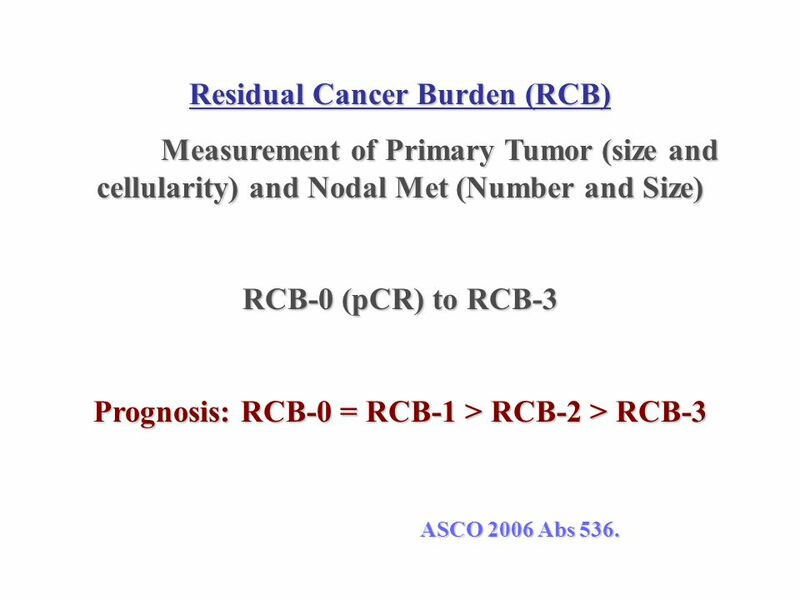 Measurement of Primary Tumor (size and cellularity) and Nodal Met (Number and Size) RCB-0 (pCR) to RCB-3 Prognosis: RCB-0 = RCB-1 > RCB-2 > RCB-3 ASCO 2006 Abs 536. Locally Advanced or Large Primary (> 3 cM). 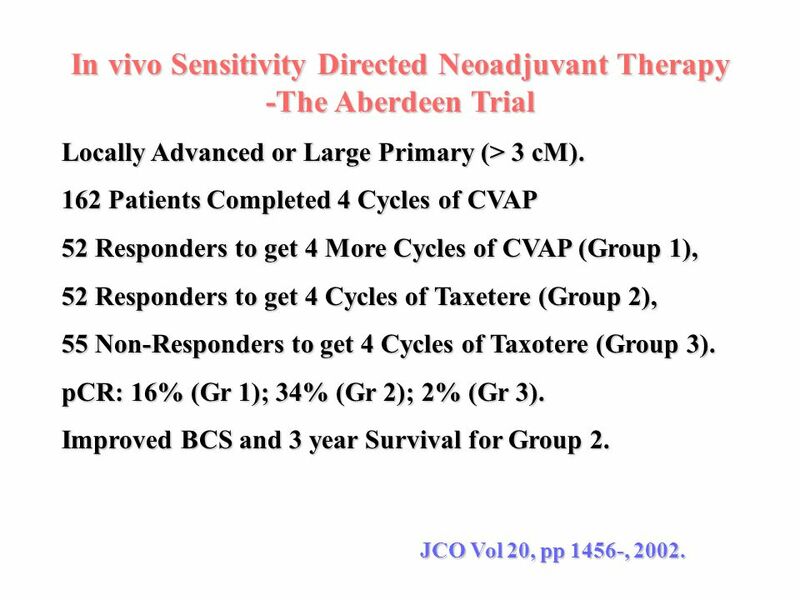 162 Patients Completed 4 Cycles of CVAP 52 Responders to get 4 More Cycles of CVAP (Group 1), 52 Responders to get 4 Cycles of Taxetere (Group 2), 55 Non-Responders to get 4 Cycles of Taxotere (Group 3). pCR: 16% (Gr 1); 34% (Gr 2); 2% (Gr 3). 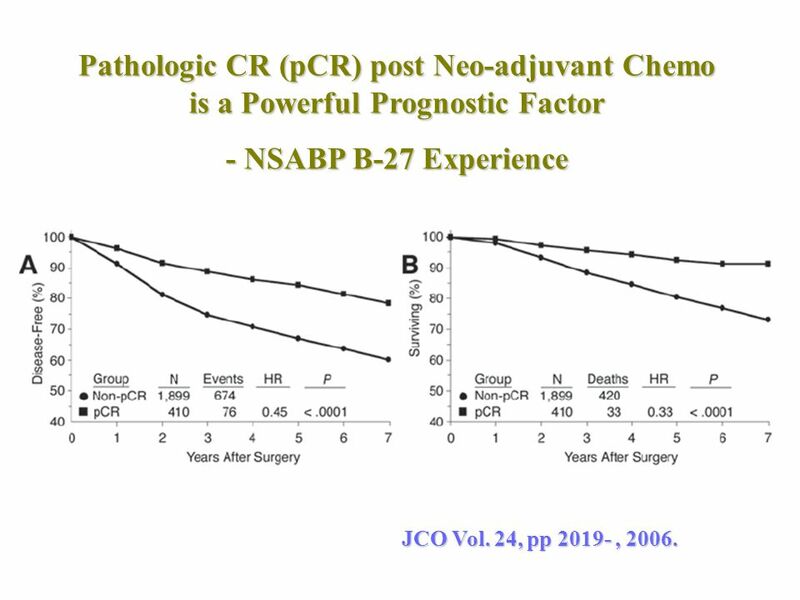 Improved BCS and 3 year Survival for Group 2. 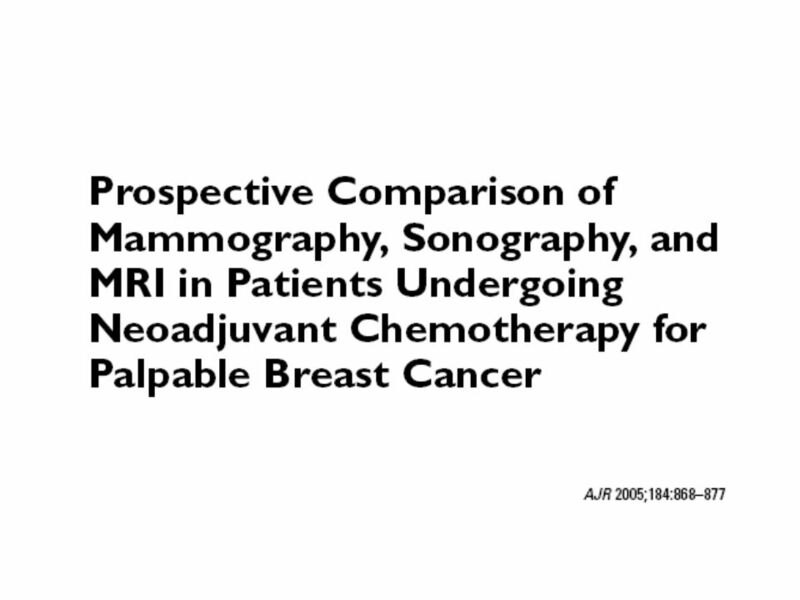 JCO Vol 20, pp 1456-, 2002. 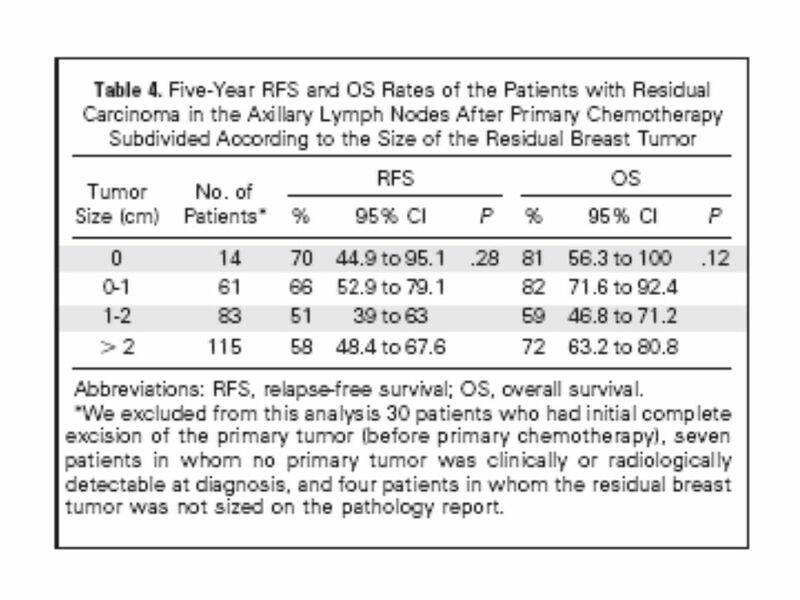 TAC x2 to Select for Responders- >50% Size Reduction Responders to Complete TAC x6. 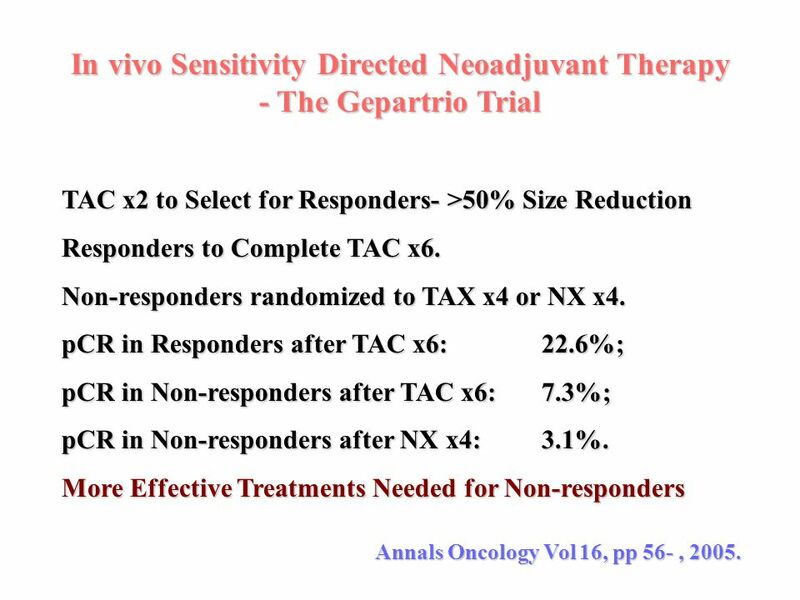 Non-responders randomized to TAX x4 or NX x4. 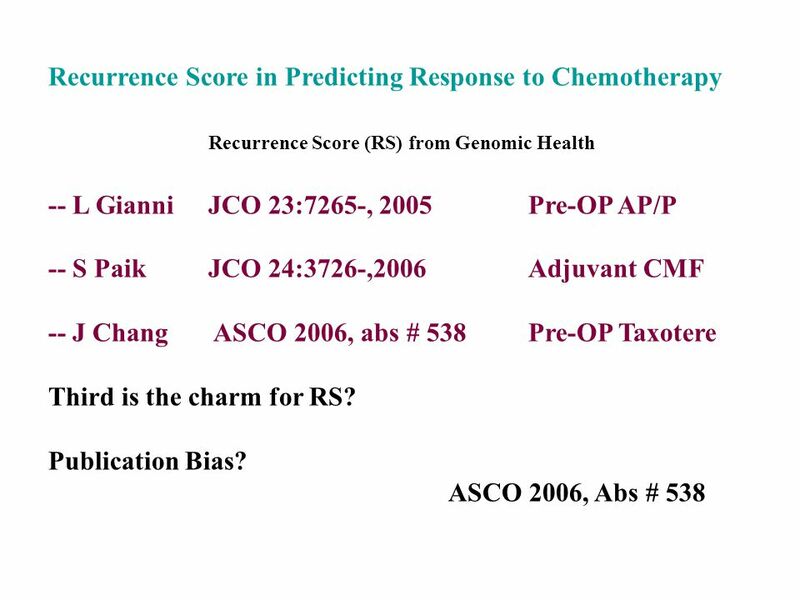 pCR in Responders after TAC x6: %; pCR in Non-responders after TAC x6:	7.3%; pCR in Non-responders after NX x4:	3.1%. 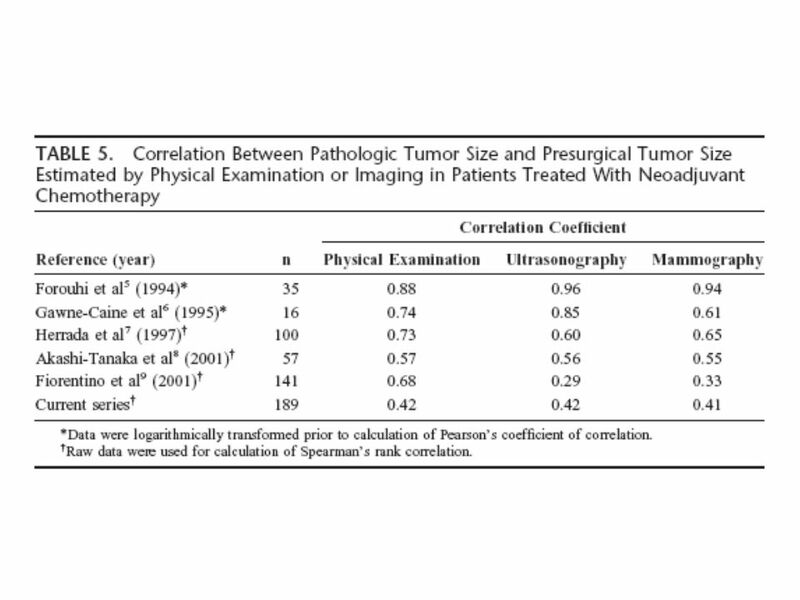 More Effective Treatments Needed for Non-responders Annals Oncology Vol 16, pp 56- , 2005. 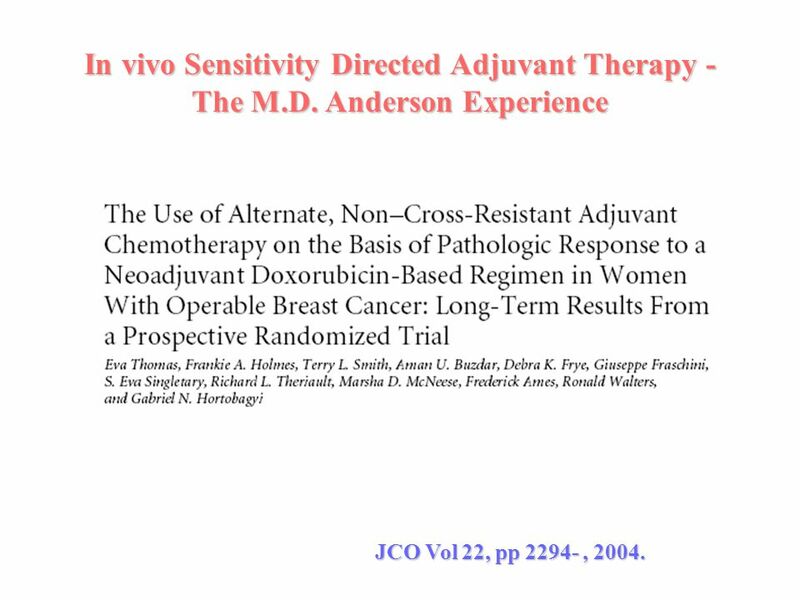 In vivo Sensitivity Directed Adjuvant Therapy - The M.D. 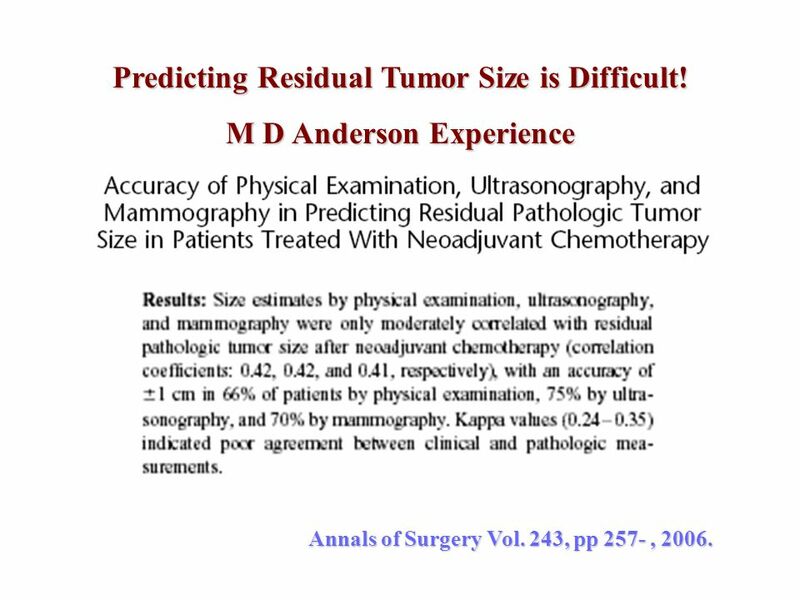 Anderson Experience JCO Vol 22, pp , 2004. 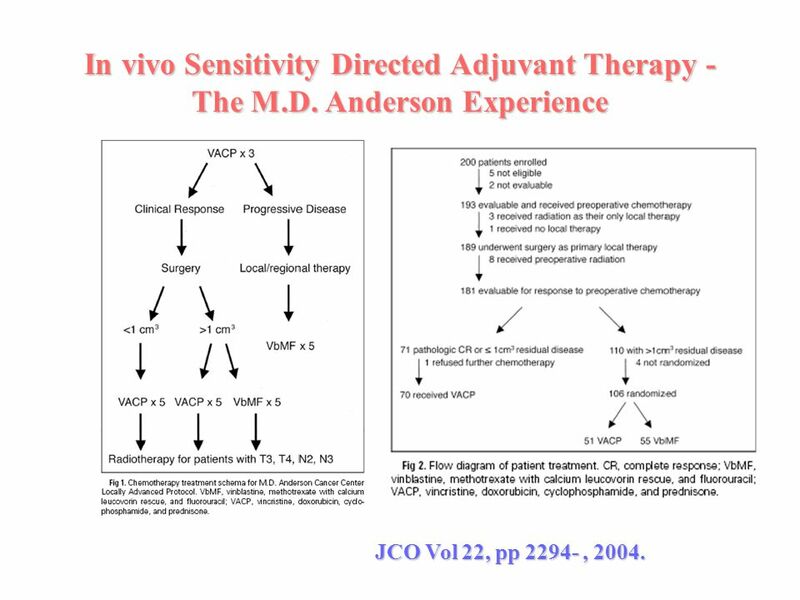 In vivo Sensitivity Directed Adjuvant Therapy - The M.D. 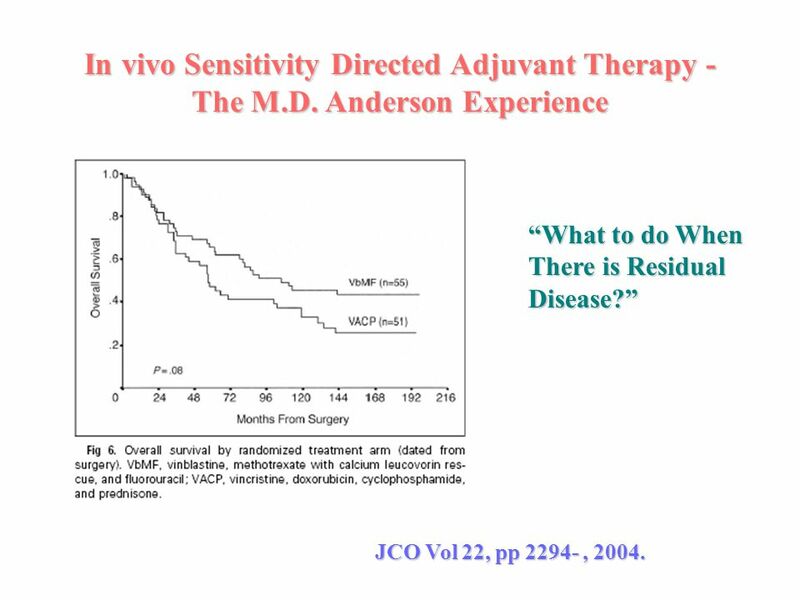 Anderson Experience “What to do When There is Residual Disease?” JCO Vol 22, pp , 2004. JCO Vol 24, pp 1940-, 2006. 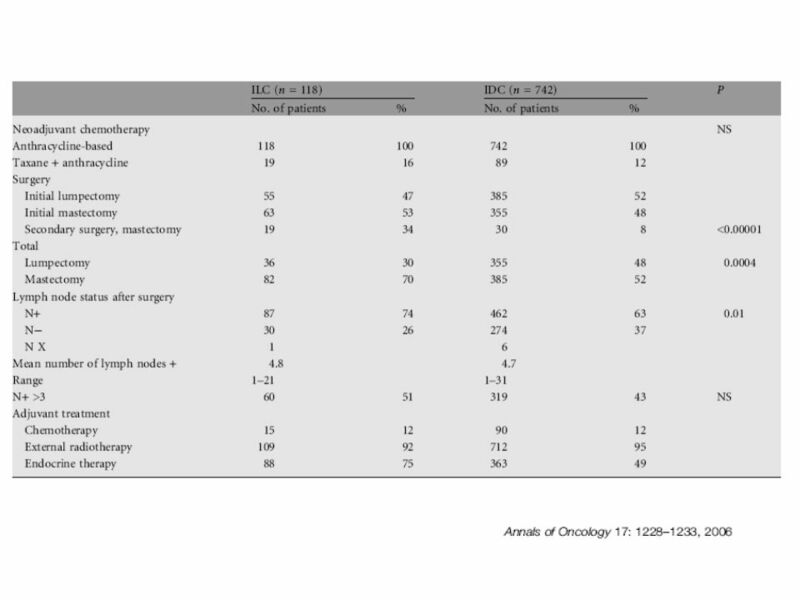 48 ILC Patients: 122 (12%) vs IDC Patients: 912 (88%). 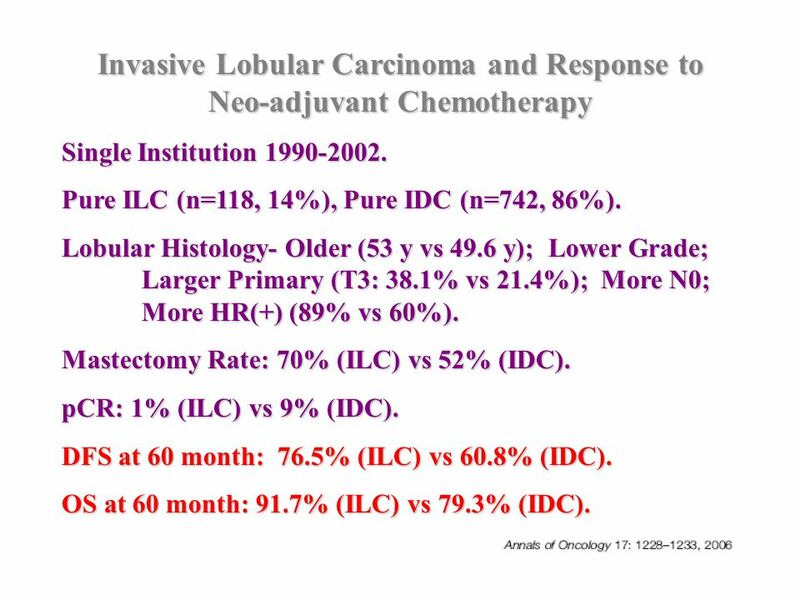 Invasive Lobular Carcinoma (vs Ductal) Older (53 y vs 47 y); More HR (+) (92% vs 62%); Lower Nuclear Grade and Higher Stage at Diagnosis. 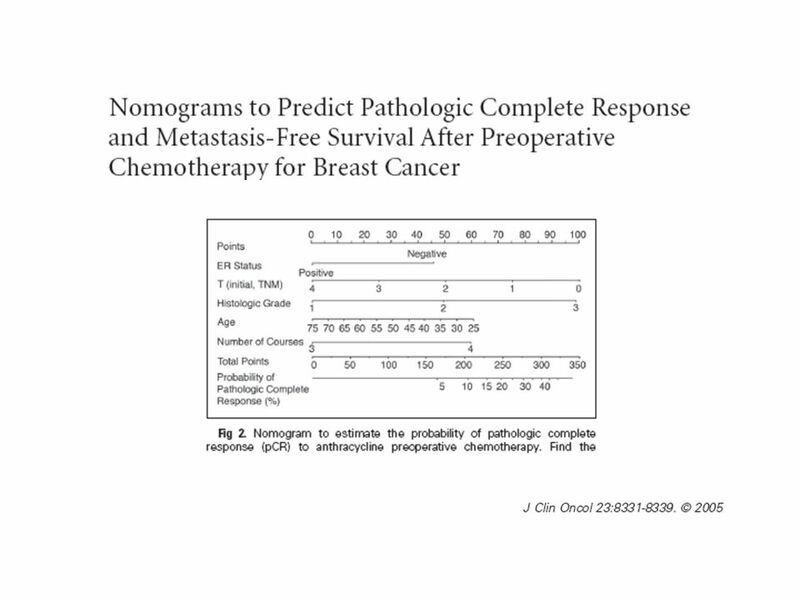 Less Likely to have pCR (3% vs 15%). 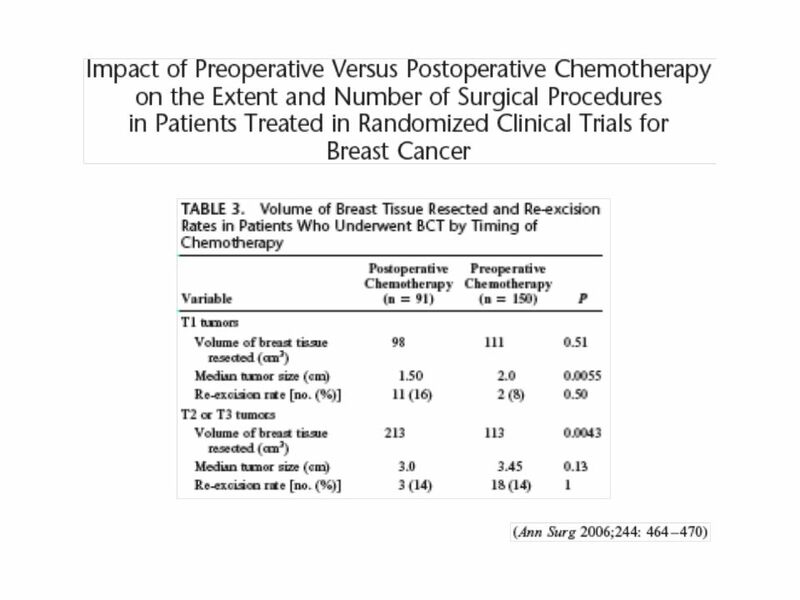 Less Breast Conservation Surgery (16% vs 29%). 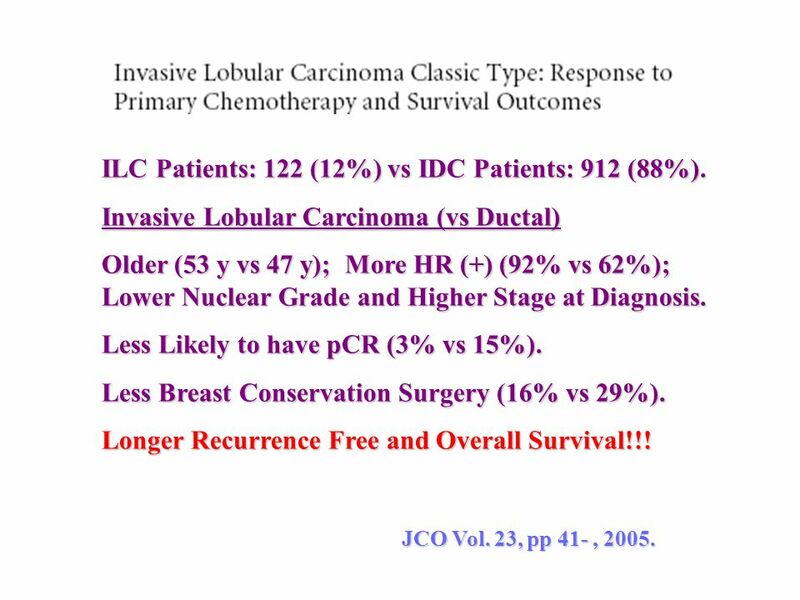 Longer Recurrence Free and Overall Survival!!! JCO Vol. 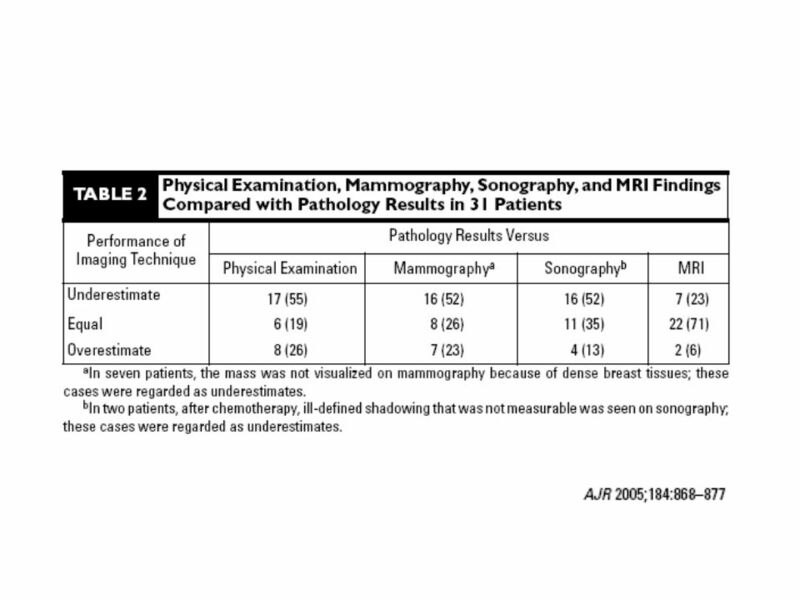 23, pp 41- , 2005. Single Institution Pure ILC (n=118, 14%), Pure IDC (n=742, 86%). 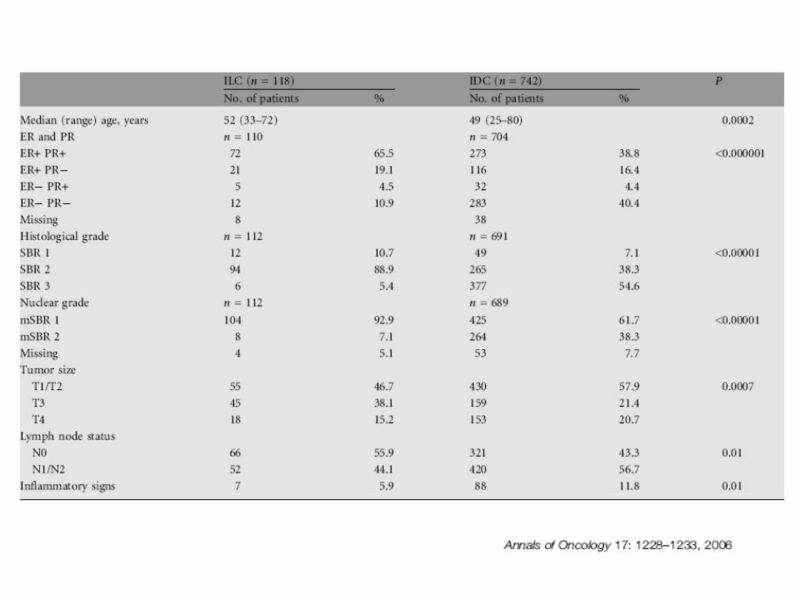 Lobular Histology- Older (53 y vs 49.6 y); Lower Grade;	Larger Primary (T3: 38.1% vs 21.4%); More N0;	More HR(+) (89% vs 60%). 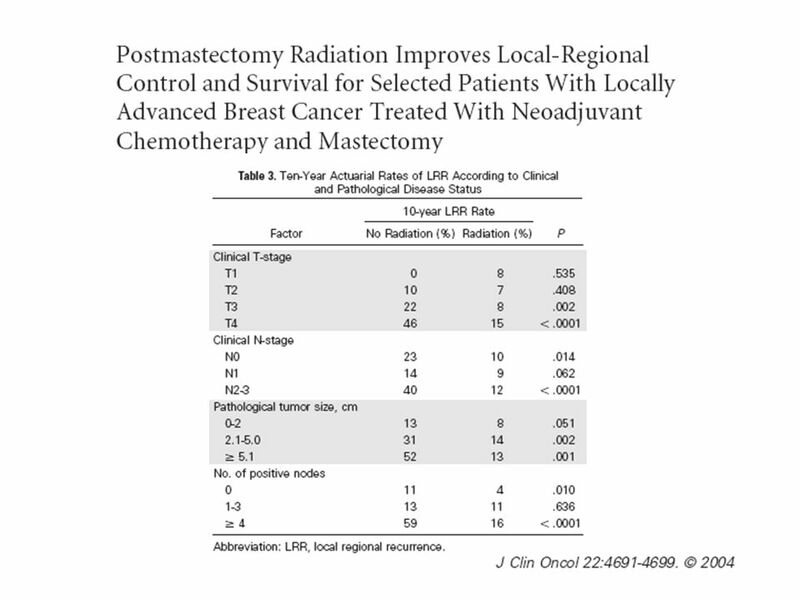 Mastectomy Rate: 70% (ILC) vs 52% (IDC). pCR: 1% (ILC) vs 9% (IDC). DFS at 60 month: 76.5% (ILC) vs 60.8% (IDC). OS at 60 month: 91.7% (ILC) vs 79.3% (IDC). 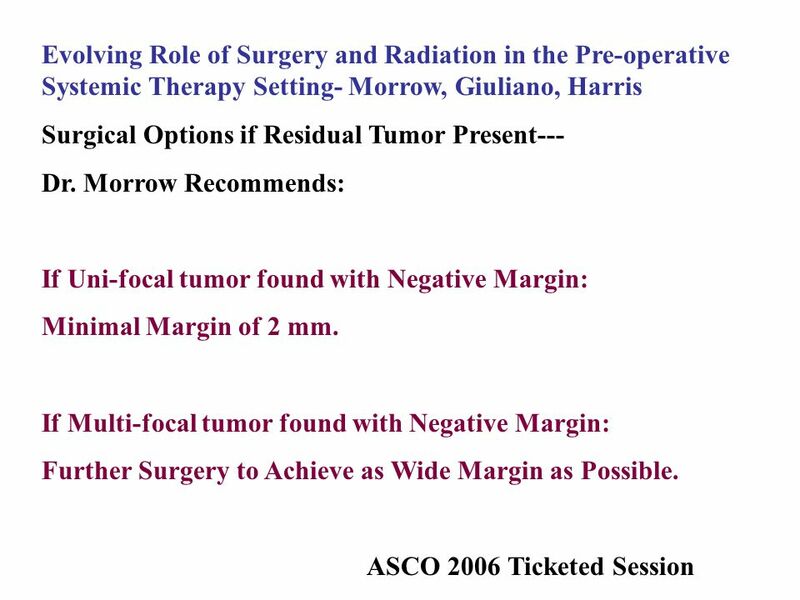 Candidate Selections as in Adjuvant Therapy	-Avoid Over-treating. 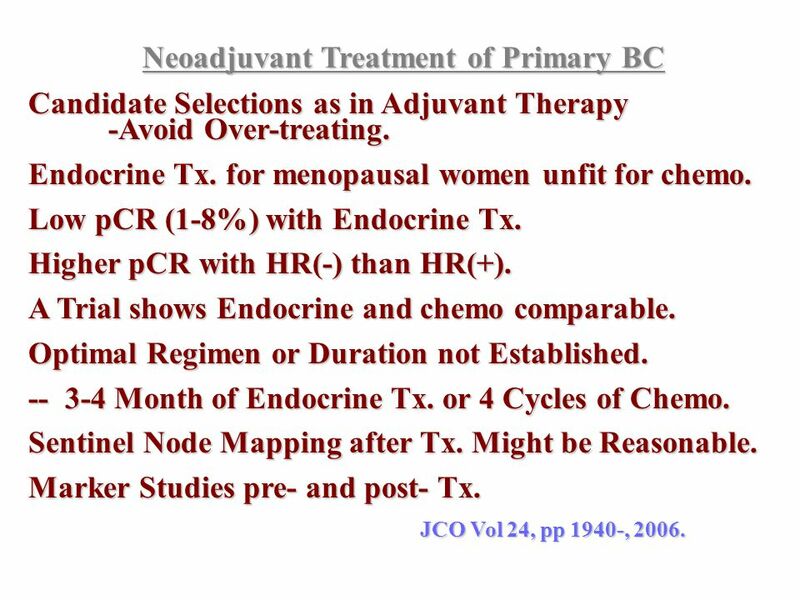 Endocrine Tx. 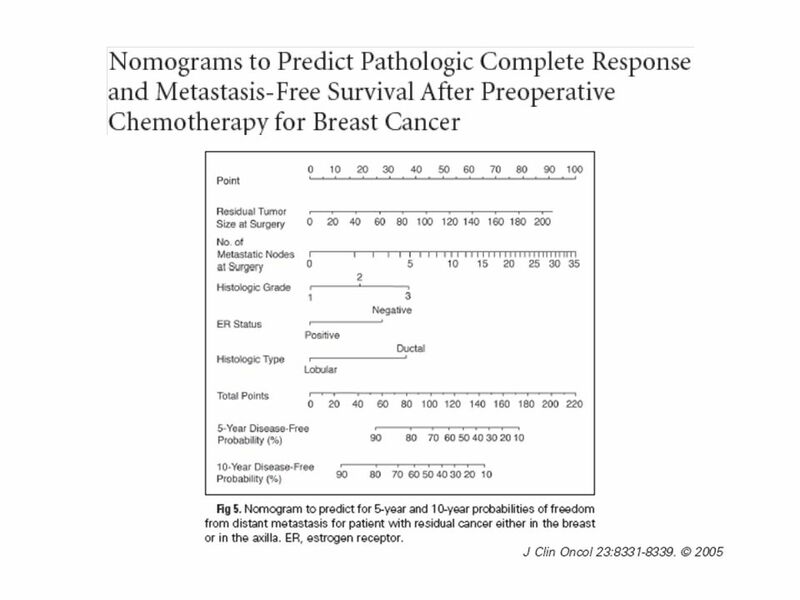 for menopausal women unfit for chemo. 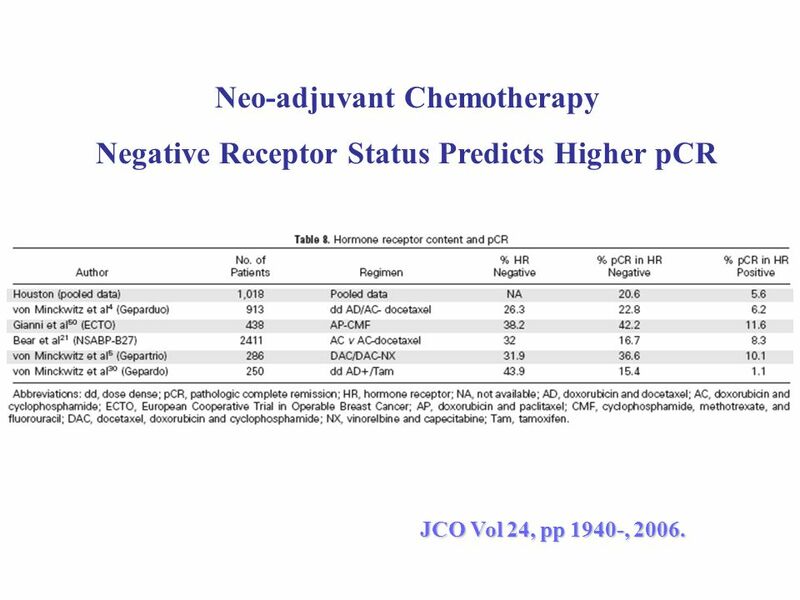 Low pCR (1-8%) with Endocrine Tx. Higher pCR with HR(-) than HR(+). 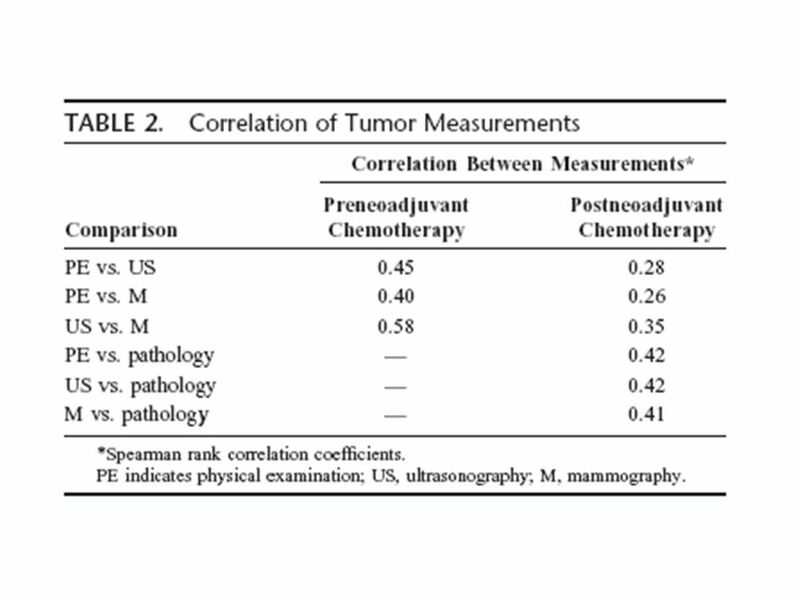 A Trial shows Endocrine and chemo comparable. 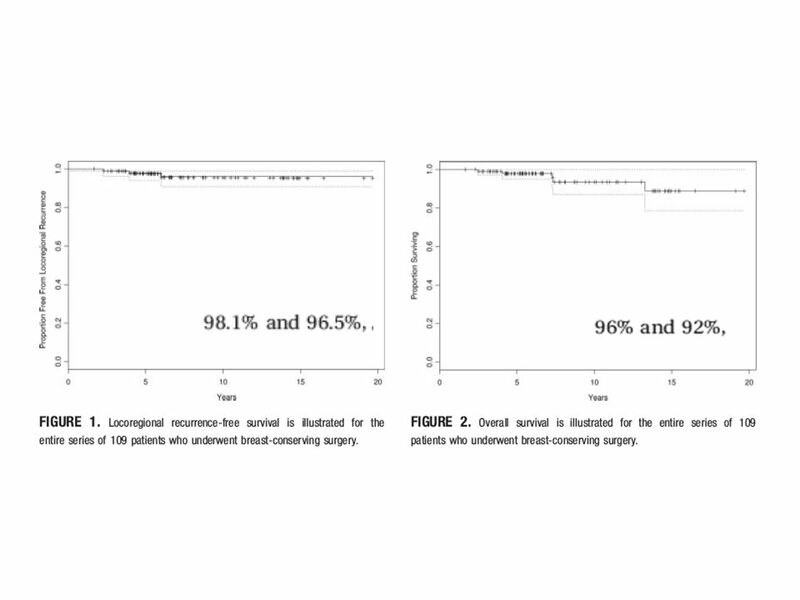 Optimal Regimen or Duration not Established. 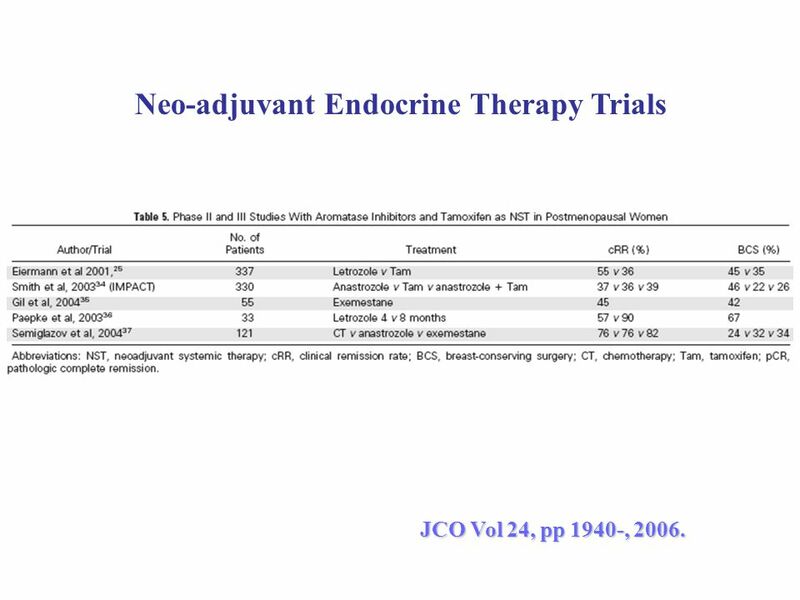 Month of Endocrine Tx. 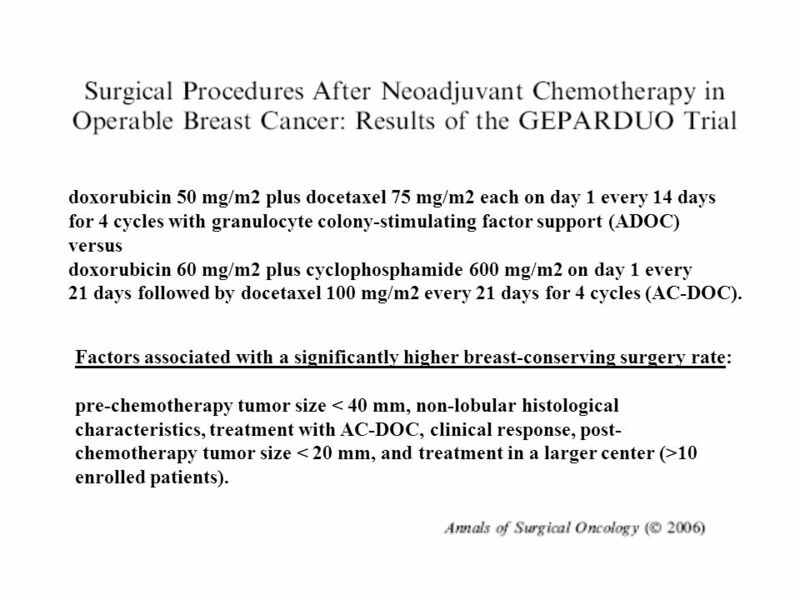 or 4 Cycles of Chemo. Sentinel Node Mapping after Tx. Might be Reasonable. 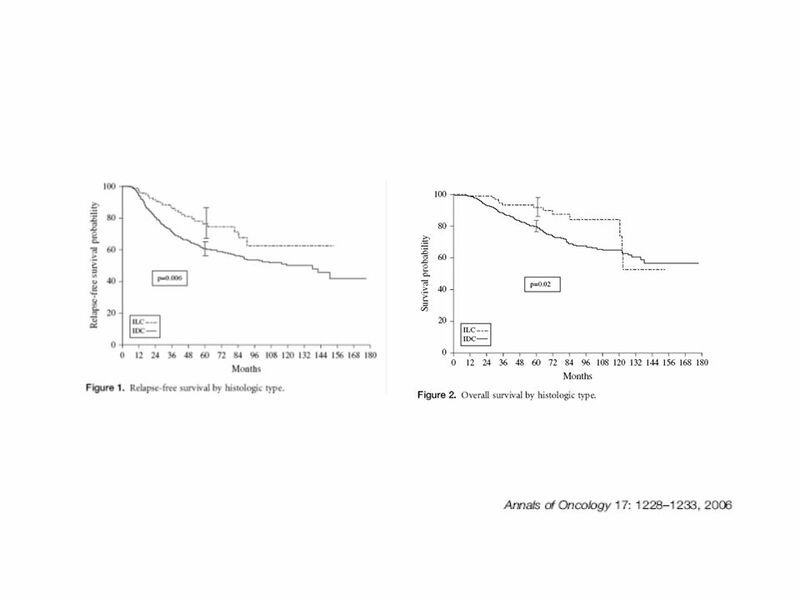 Marker Studies pre- and post- Tx. JCO Vol 24, pp 1940-, 2006. 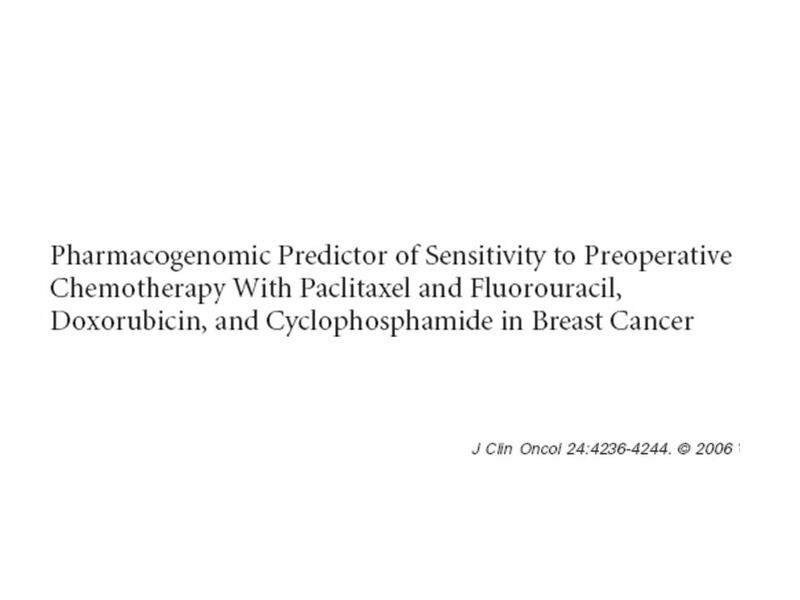 A60C600 X 4cycles q2W followed by	Taxol175 (N=34) or Taxotere (N=8) q2W. 42 Patients (6IIA, 12IIB, 10IIIA, 5IIIB, 9IIIC). 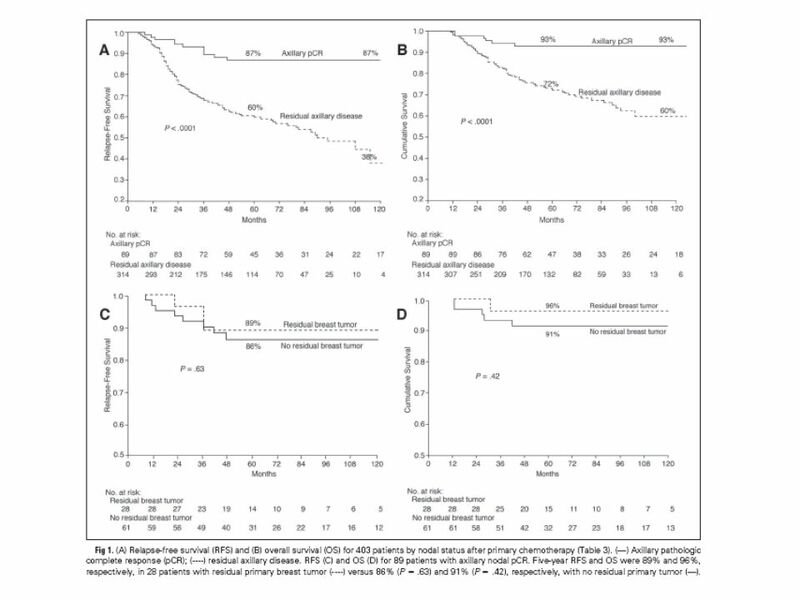 Grade III 19, ER(+) 18, HER-2(+) 8, Clinically N(+) 26. cCR plus cPR > 95%. pCR 33%(14/42) -- pCR 52.4% (HR-) versus 17.6% (HR+). 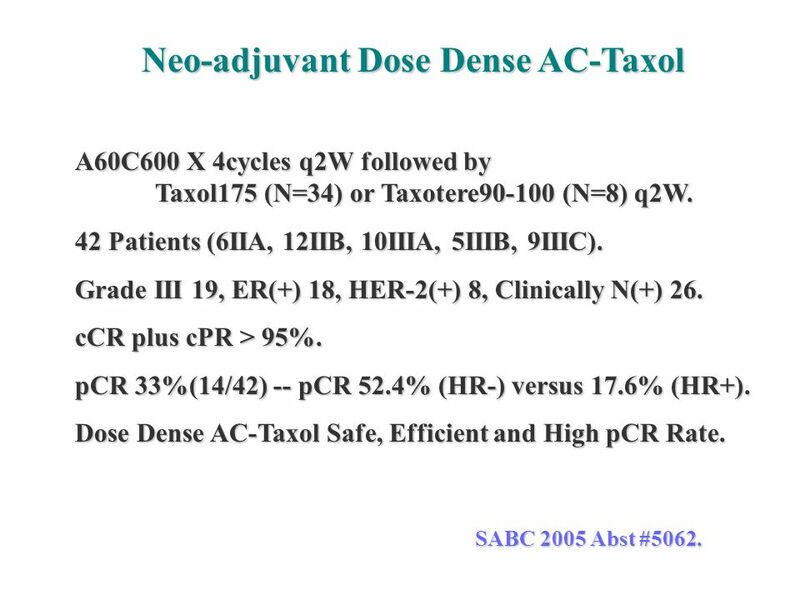 Dose Dense AC-Taxol Safe, Efficient and High pCR Rate. SABC 2005 Abst #5062. 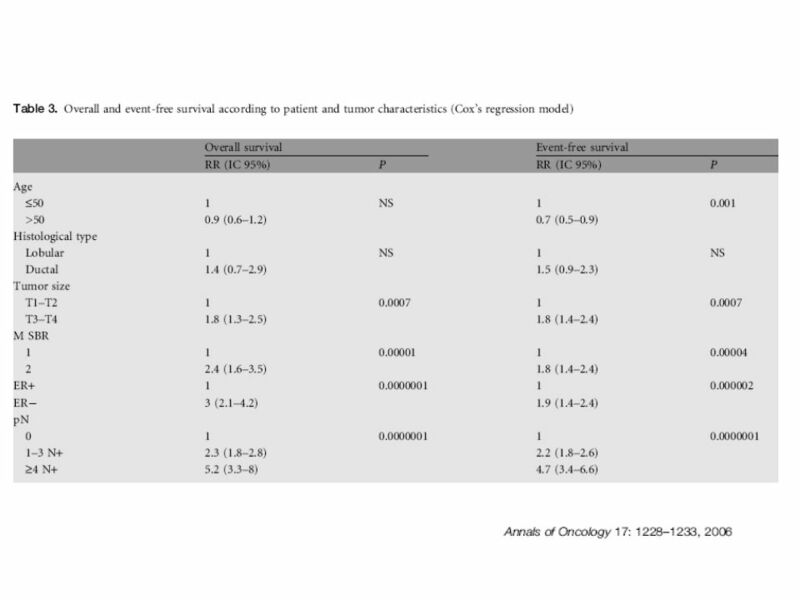 Neo-adjuvant Chemo for Stage II/III BC Mature Result from a Randomized Phase III Trial. 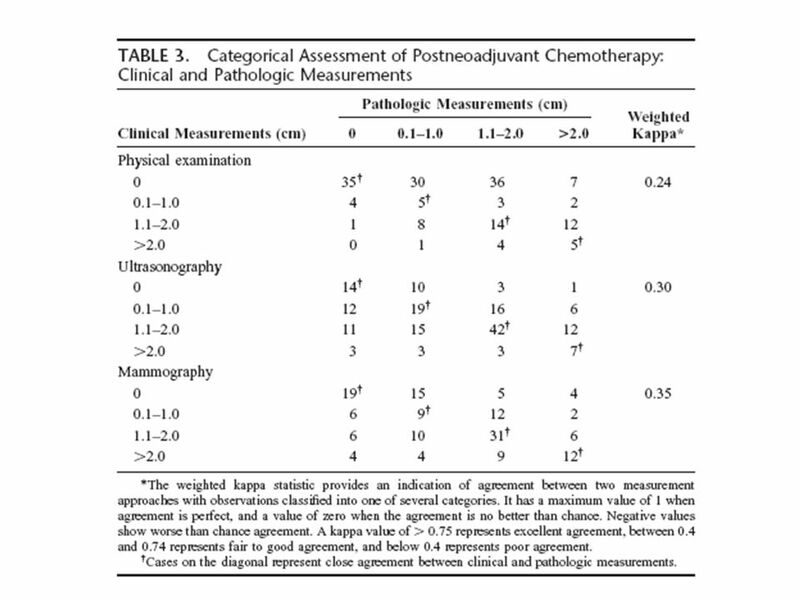 Positive Axillary Nodes by PET or FNA. A60C600 q3W X4 versus D75X(1000bid d1-14) q3W X4. 209 Patients (Aug 02-April 05). 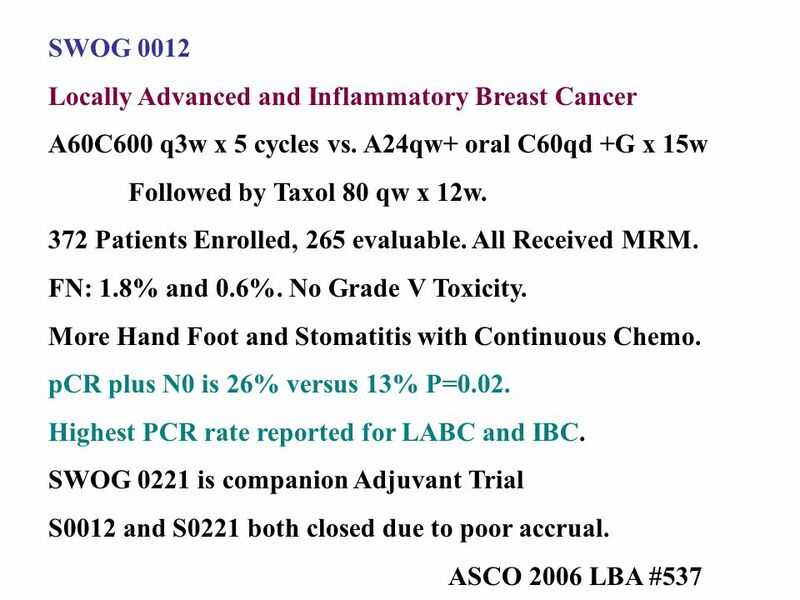 Primary Tumor pCR DX (23%) versus AC (8%) p= More Hand-Foot Syndrome, Skin ∆ Mucositis with DX . SABC 2005 Abst #5052. 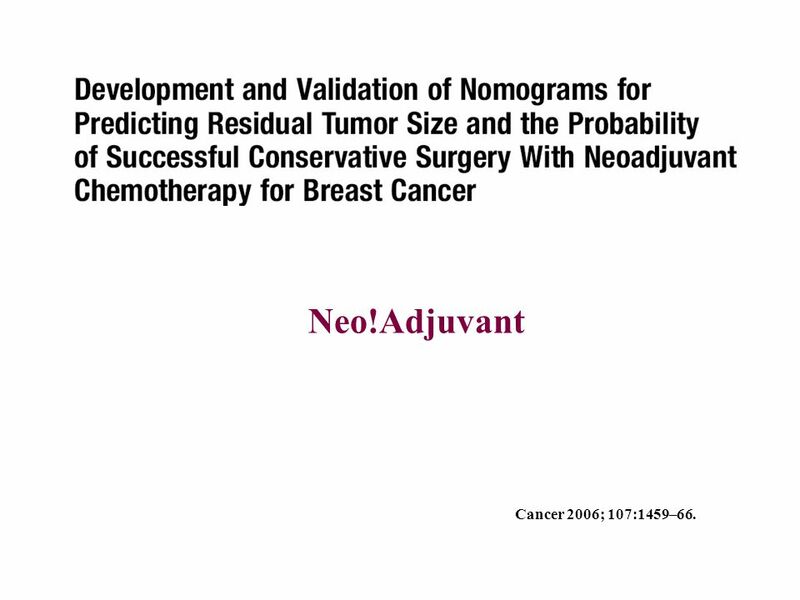 Download ppt "Neo-adjuvant Chemotherapy for Breast Cancer"
San Antonio Breast Cancer Symposia Authors: Dr. Sunil Verma Date posted: January 6 th, 2008. 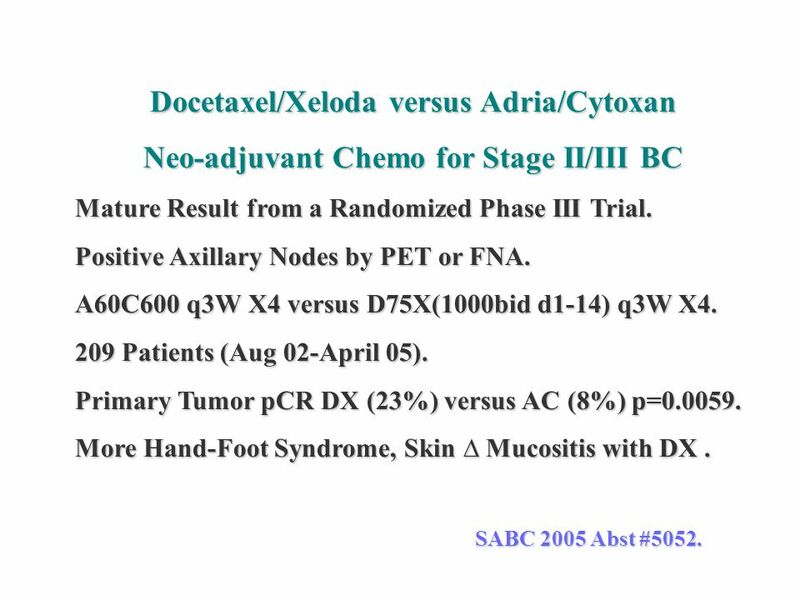 Neo-Adjuvant Systemic Treatment: Current Modalities Luc Y. Dirix Medical Oncology Oncologisch Centrum GvA, Antwerp. October 14, 2006. 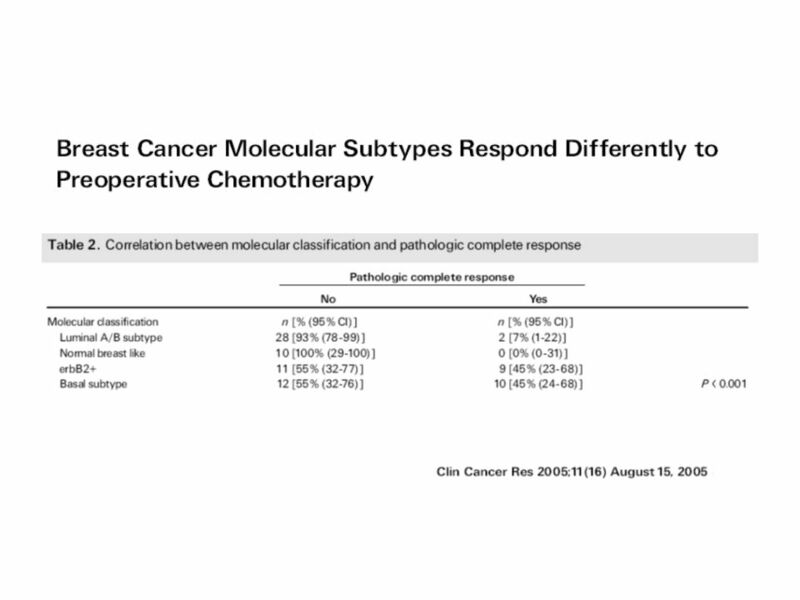 Gynecologic Oncology Group Gynecologic Oncology Group Uterine Corpus Trials: GCIG David Scott Miller, M.D., F.A.C.O.G., F.A.C.S. Director and Dallas Foundation. Breast Cancer. Introduction Most common female cancer Accounts for 32% of all female cancer 211,300 new cases yearly and rising 40,000 deaths yearly. 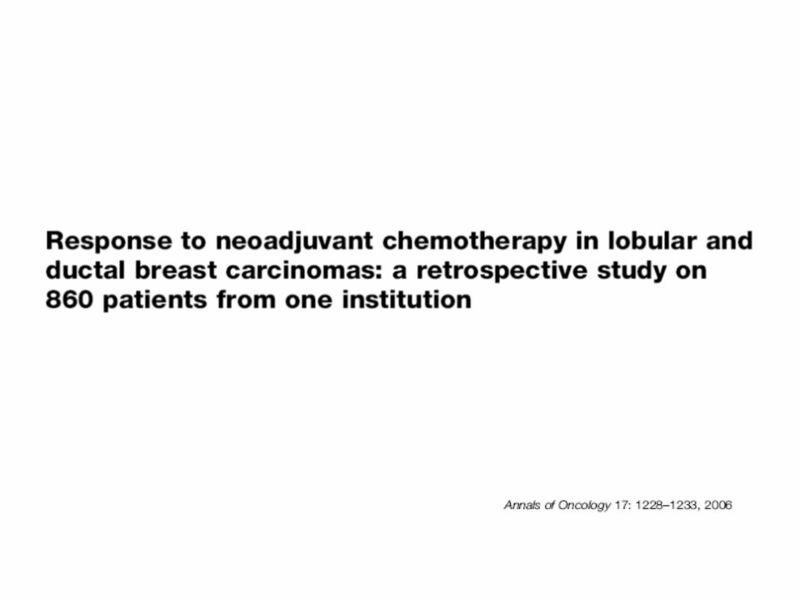 Chemotherapy Prolongs Survival for Isolated Local or Regional Recurrence of Breast Cancer: The CALOR Trial (Chemotherapy as Adjuvant for Locally Recurrent. 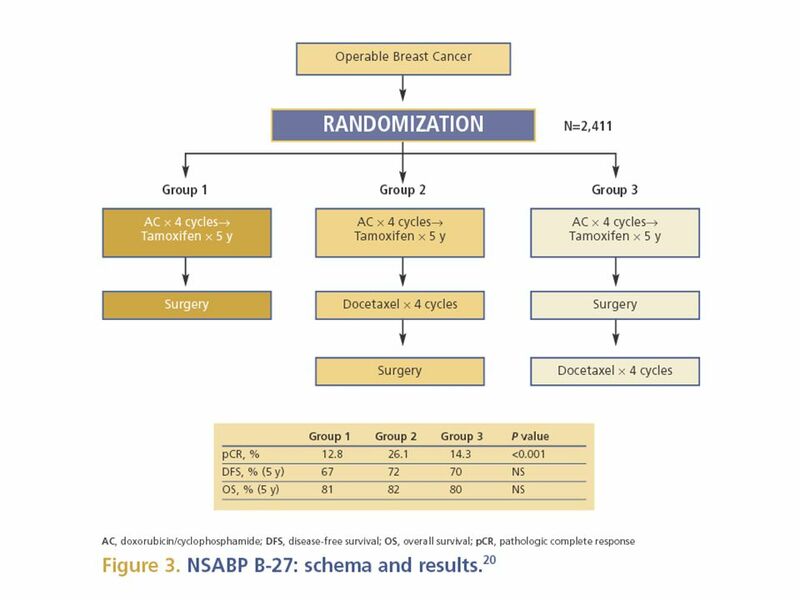 Integration of Capecitabine into Anthracycline- and Taxane-Based Adjuvant Therapy for Triple Negative Early Breast Cancer: Final Subgroup Analysis of the. 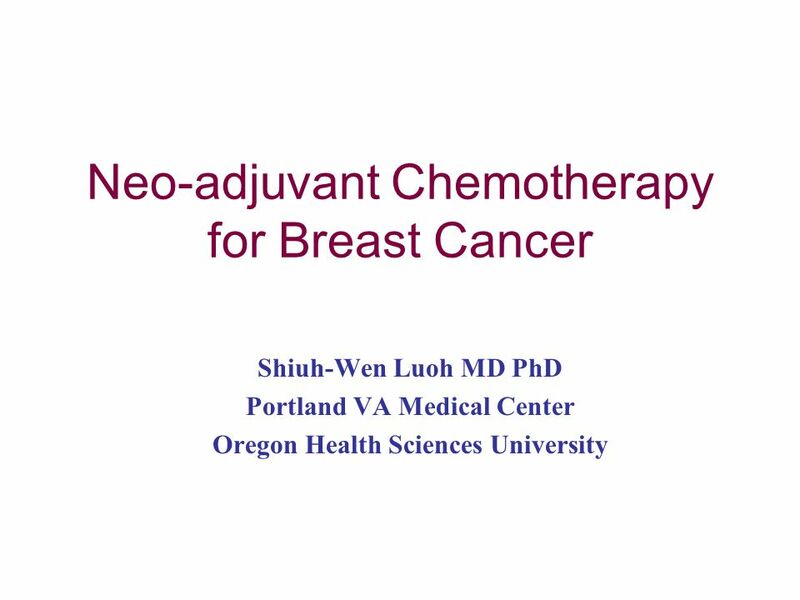 SABCS 2011 Metastatic Breast Cancer Shiuh-Wen Luoh MD PhD Clinical Associate Professor Comprehensive Breast Cancer Clinic Hematology and Medical Oncology. 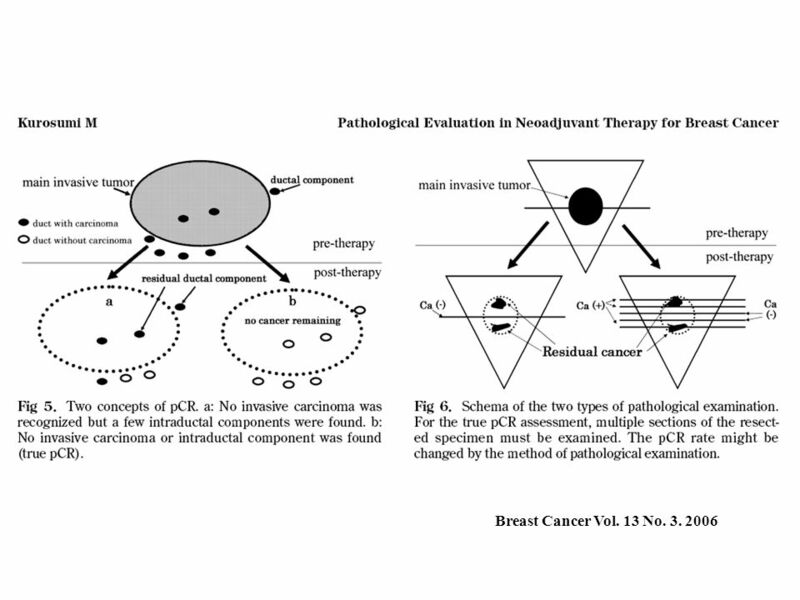 SON Breast Cancer Update: Current Controversies Oct 18, 2014 Who should we radiate and why? Lorna Weir Radiation Oncologist BC Cancer Agency, Vancouver. 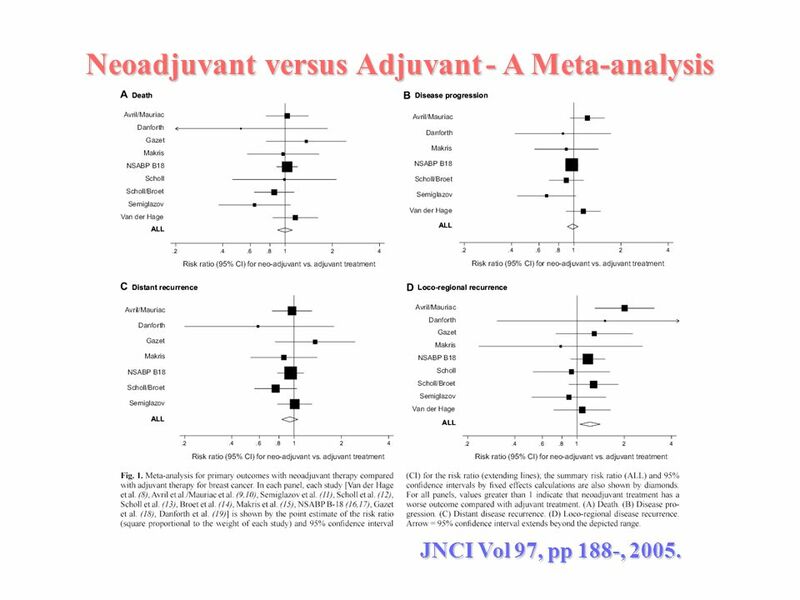 Neoadjuvant Chemotherapy in Ovarian Cancer Key issues in trial design.